Sauté the red onions in 1/2 tbsp of butter until soft. Add the kale and sauté until wilted. Scramble the eggs in a bowl and add salt and pepper then add to the pan once the kale is wilted. Stir to integrate everything together and serve immediately once eggs are cooked. 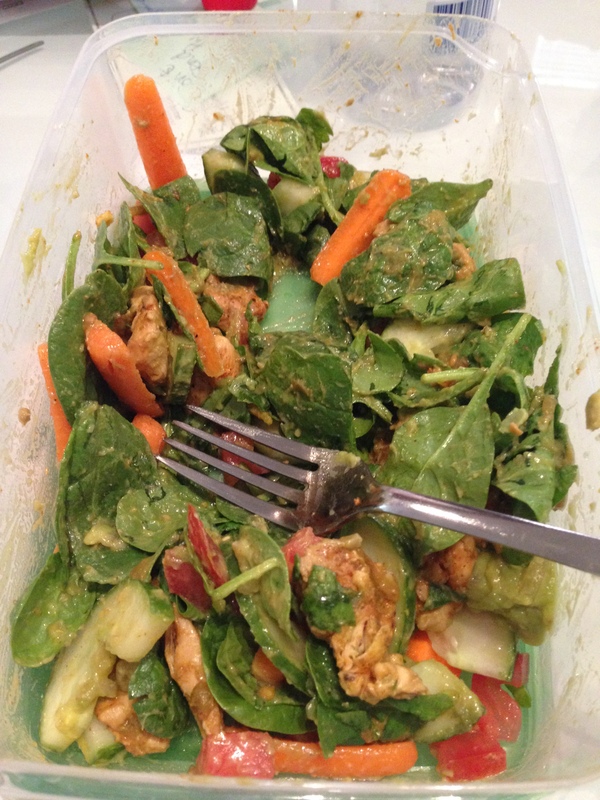 Put all ingredients in a large bowl and enjoy your salad! Cut cauliflower into 1 inch florets and half or quarter Brussel sprouts, mince 2 cloves of garlic. Toss all ingredients in a bowl with a little oil of your choice and salt and pepper. Spread on a baking sheet and roast for 20 minutes. Rub sunflower oil on the bottom of a baking dish and place salmon filet in dish. Squeeze some lemon juice over the salmon then sprinkle lemon zest and tear some fresh dill to sprinkle over the salmon as well. Add sea salt and a little freshly cracked pepper. Put in the oven for the last 12-15 minutes that the veggies are cooking. While everything is in the oven, heat a teaspoon of olive oil in a pan over medium heat. Trim the ends off of about 8 asparagus spears and mince 1 clove of garlic and a little fresh ginger root. 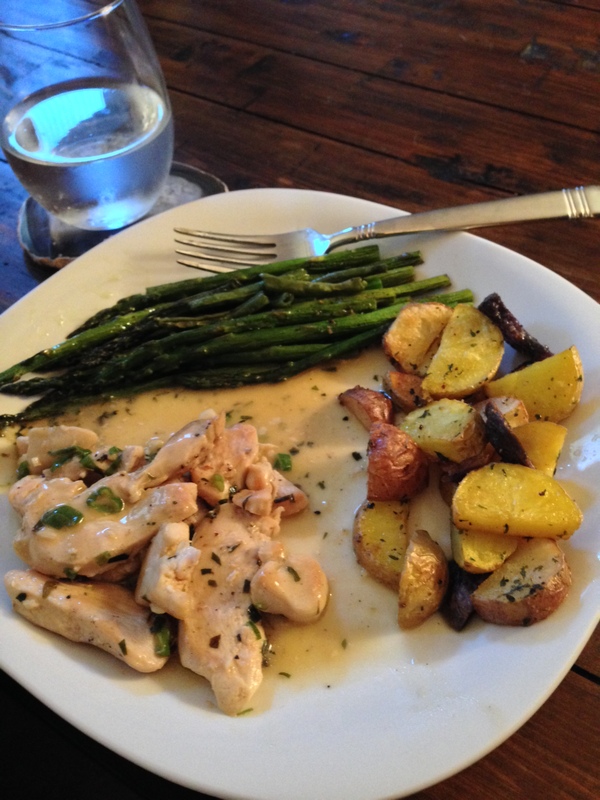 Once the oil is hot, add asparagus, garlic, ginger, a squeeze of fresh lemon juice and lemon zest to the pan. 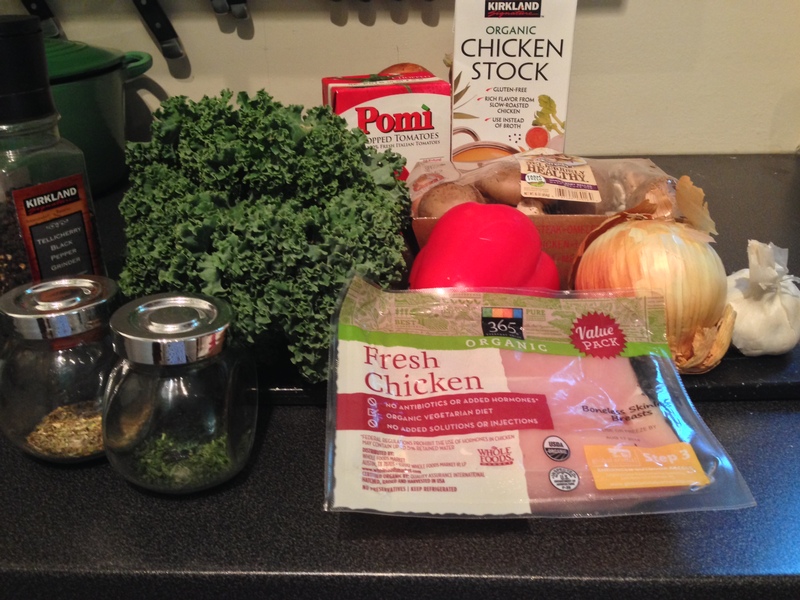 After a few minutes, add a splash of organic chicken broth to the pan. Sauté until everything is tender, about 8 minutes. I forgot to post this when I actually finished but I did the entire Whole 30! By the end of it I felt really good, lost 8 pounds, and changed my relationship with food. I was SO tired of cooking that I honestly didn’t eat as much just because the thought of cooking yet another meal was enough to keep me from eating. I will definitely keep a lot of these habits moving forward though. 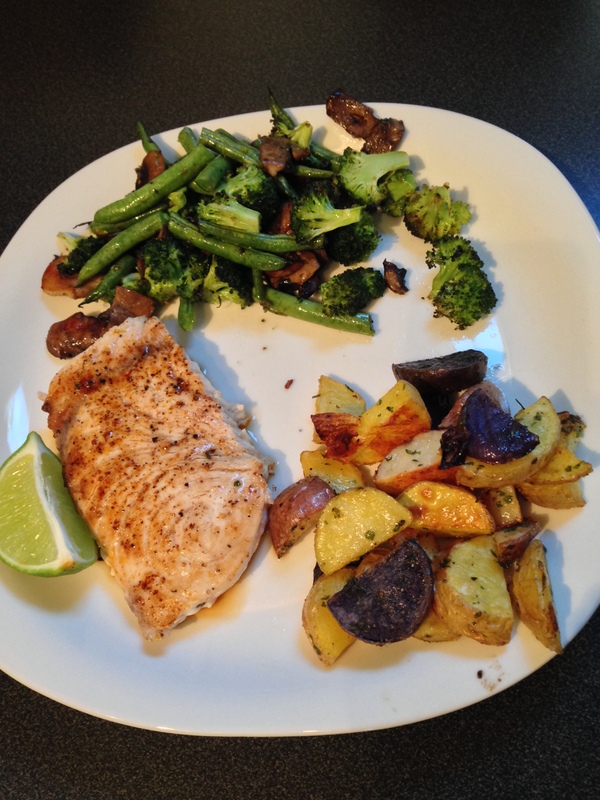 Following the whole 30 shopping guidelines and meal plans at home for the most part but being able to eat out occasionally would be sustainable for a long time. Overall, I would recommend this plan, definitely one of the best cleanses or detoxes that I have done over the years! Cold-pressed black coffee may be my new favorite thing on earth…which means my taste buds are seriously changing doing this program! Also, I would say that while I don’t have crazy “tiger blood” energy, I DO have energy that last all day. After work I run errands, cook, do chores around the house, work on our Spain to-do list, and never notice my energy draining during the day, even when I’m ready go to bed. The hardest thing about the Whole30 is just cooking every single meal. That is the only real struggle that I’ve had – the only convenience I can find is if I planned ahead and worked for it. I’m 22 days in now though, there’s no turning back from here!! Pot Roast reminds me of Sunday lunches after church with my family when I was growing up in Texas, serious comfort food. It still one of my favorite meals, this is serious comfort food!! 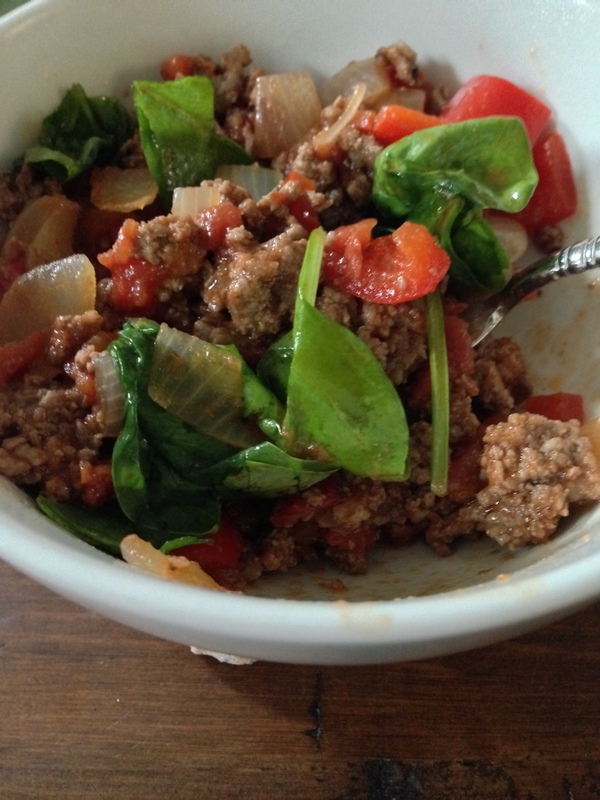 I have adapted this recipe by borrowing ideas from quite a few sources and combining them all to make a gluten-free, dairy-free, paleo, Whole30 compliant, etc. version of this traditional dish, and it’s still really delicious! 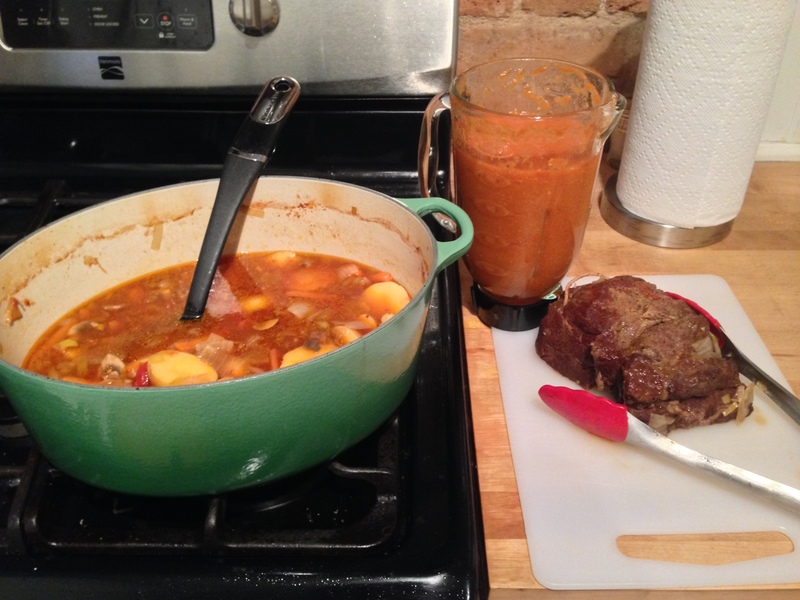 Ina Garten’s Company Pot Roast is my primary source of inspiration for this, her technique is really great for thickening the sauce even without the flour, butter, and wine that she uses. This recipe takes some time, but you won’t need to be in the kitchen the entire time. You’ll need about an hour for chopping, searing, and stirring during the afternoon and then it needs to cook for 2.5 hours after that. You’ll then need about 15 minutes to finish the sauce and serve. So if you want to serve dinner at 7, get started around 3:15. Preheat the oven to 275 degrees fahrenheit and begin chopping all of your veggies, I chopped mine a few hours ahead to speed up cooking time. Pat the beef dry with a paper towel. Season the roast all over with salt and pepper. In a large, oven-safe Dutch oven pot, heat 2 tablespoons olive oil over medium heat. 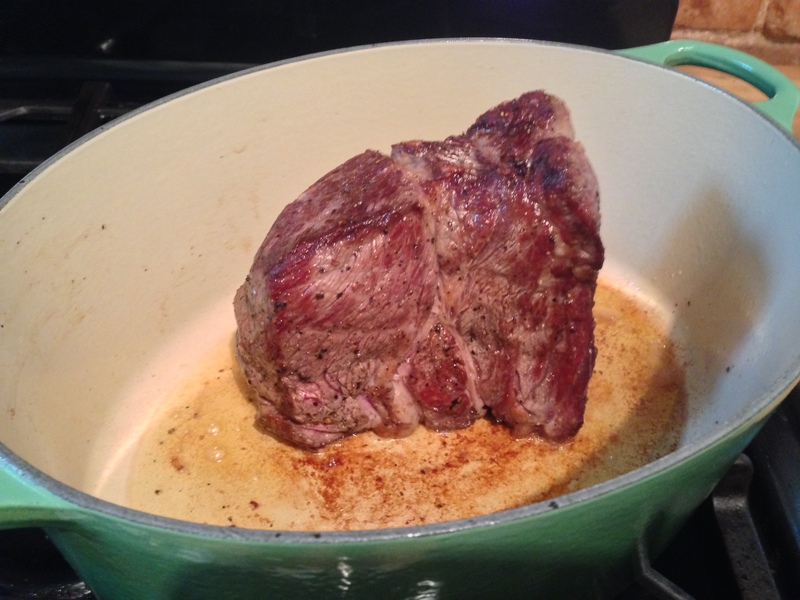 Add the roast and sear for 4 to 5 minutes on each side as well as the ends, until nicely browned all over. Remove the roast from the pan. Add about 2 more tablespoons olive oil to the Dutch oven. 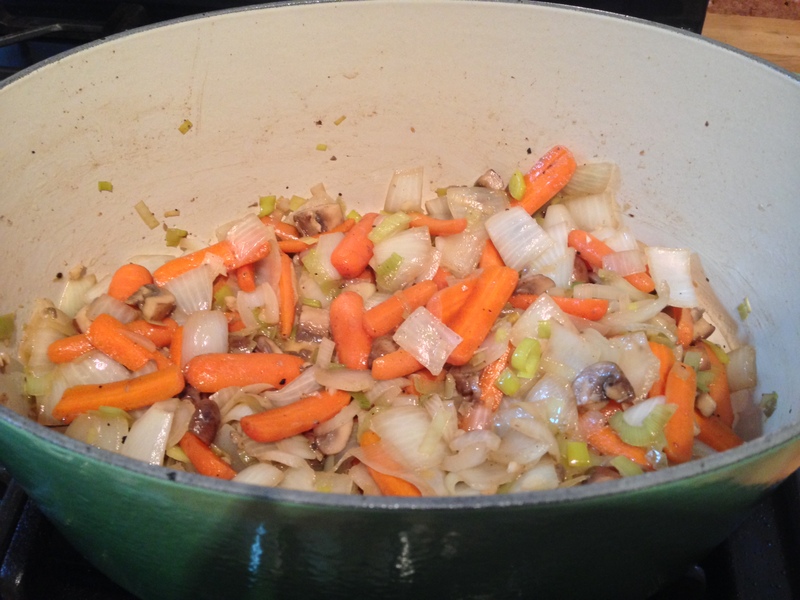 Add the carrots, onions, mushrooms, leeks, garlic, more salt and pepper, and cook over medium heat for 10 to 15 minutes, stirring occasionally, until all of the veggies are tender but not brown, like the picture below. Add the beef broth and deglaze the pan (scrape all of the brown bits off of the bottom) then bring to a boil. Add the tomatoes, 2 teaspoons salt, and 1 teaspoon pepper. Add the potatoes and then put the roast back into the pot, try to make sure the liquid is covering almost all of the roast and veggies. 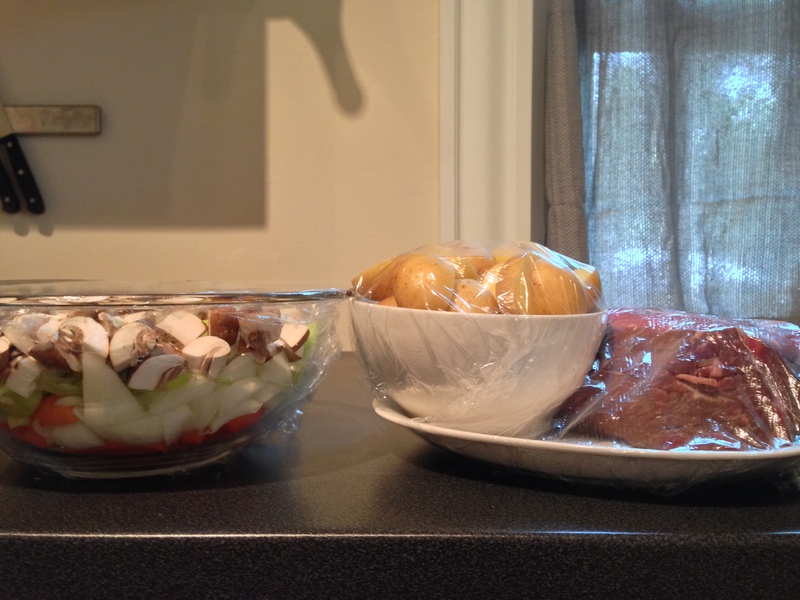 Bring to a boil once again, cover, and place the covered pot in the oven for 2 1/2 hours, until the meat is fork tender. 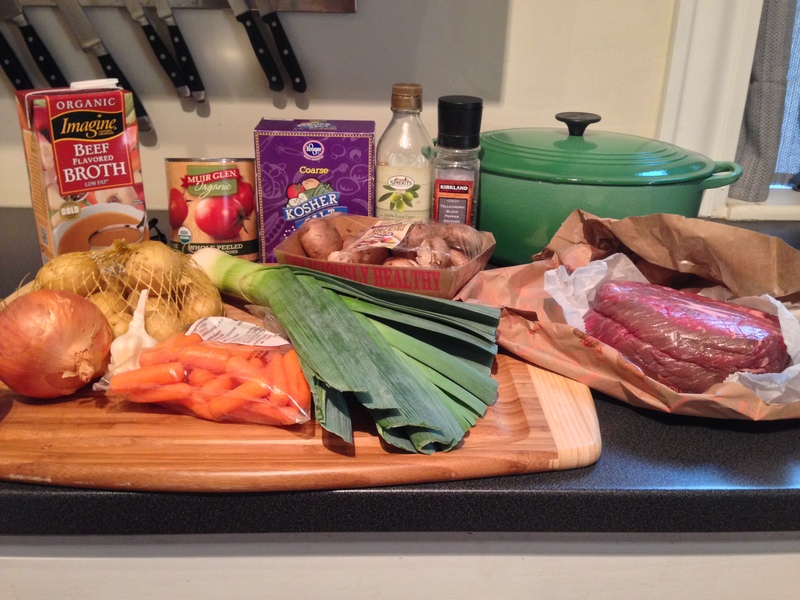 Remove the roast to a cutting board. Skim off as much fat as possible from the sauce. This is really important part: transfer quite a bit of the sauce and vegetables to a blender (enough to fill up a fairly large blender) or a food processor fitted with the steel blade and pureé until smooth. 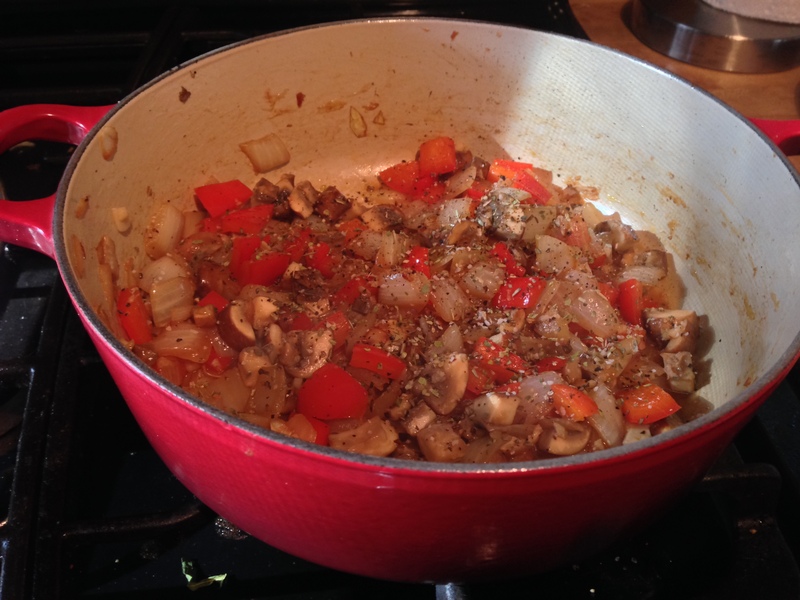 Pour the pureé back into the pot, place on the stovetop over low heat, and return the sauce to a simmer. Taste for seasonings and let the sauce continue to simmer. Meanwhile, remove the strings from the roast, and slice the meat. Serve warm with the sauce spooned over it. The sauce is so good that my husband was literally drinking the extra sauce off of his plate! 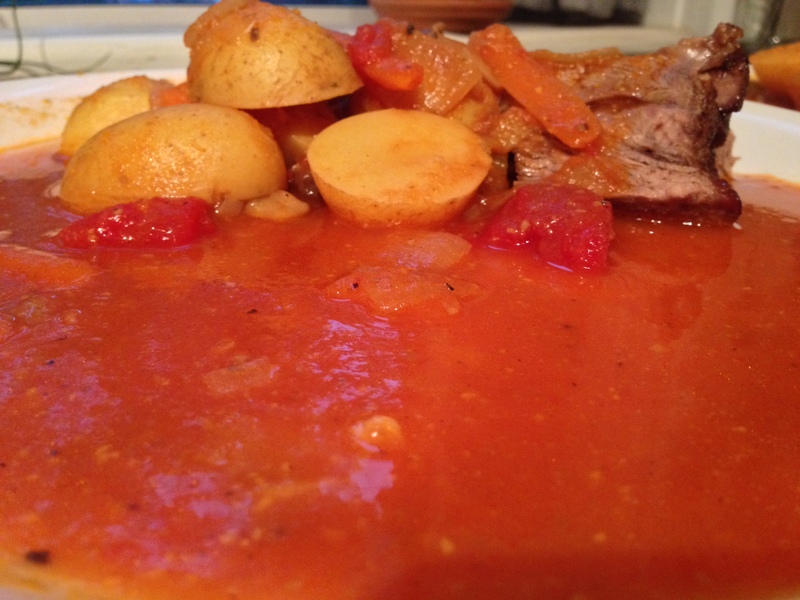 For leftovers, I cut the rest of the meat into bite size pieces and add them back into the sauce and serve it as a stew, seriously tasty! Hope you enjoy this one as much as we do! This is one of those meals that was a complete experiment and it actually turned out really well. 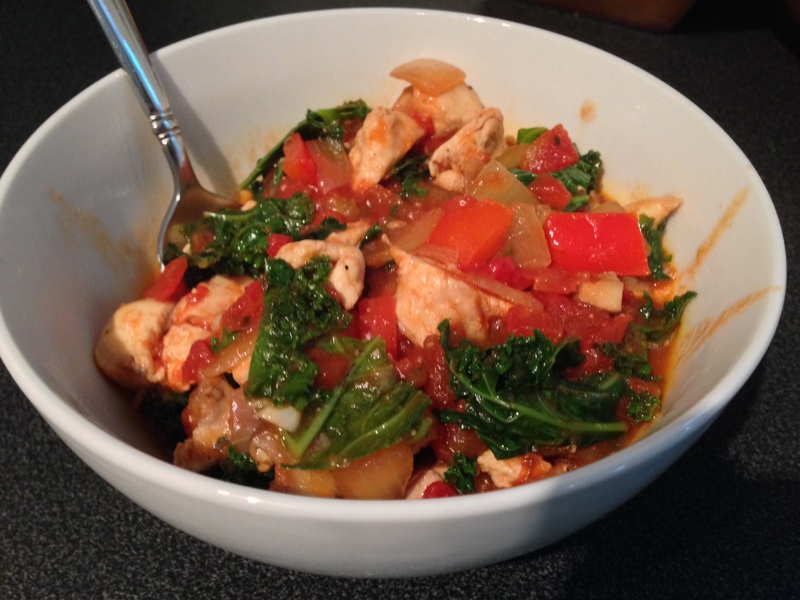 It’s kind of Roman Chicken meets Seafood Cioppino…kind of. However you describe it, it’s delicious and hearty and an excellent Whole30 compliant meal and (bonus) it’s really easy too! Heat olive oil (just enough to cover the bottom) in large pot over medium heat. Sprinkle salt and pepper over chicken then place in oil in bottom of pot in a single layer. Be careful putting the chicken in the oil! Cook about 3 minutes until starting to turn golden brown, turn chicken and cook 3 minutes on the other side, then remove from pot. Add onions and cook over medium heat for about 5 minutes until they begin to soften and become translucent. Add red pepper and cook for another 4-5 minutes. You can add a little more olive oil also, if needed. Next, add the mushrooms and cook for another 5 minutes or so. Add garlic and cook for about 1-2 minutes until you can smell the garlic but it isn’t yet burning. Add chicken stock and deglaze the pan (scrape the brown bits off the bottom and into the stock). Add a sprinkling of oregano, salt & pepper and stir. Add tomatoes and return chicken to the pot. Bring to a boil, then reduce to a simmer. Add kale and mix into the liquid well, then simmer for 5-10 minutes until the sauce is the consistency you want. Serve immediately and enjoy! 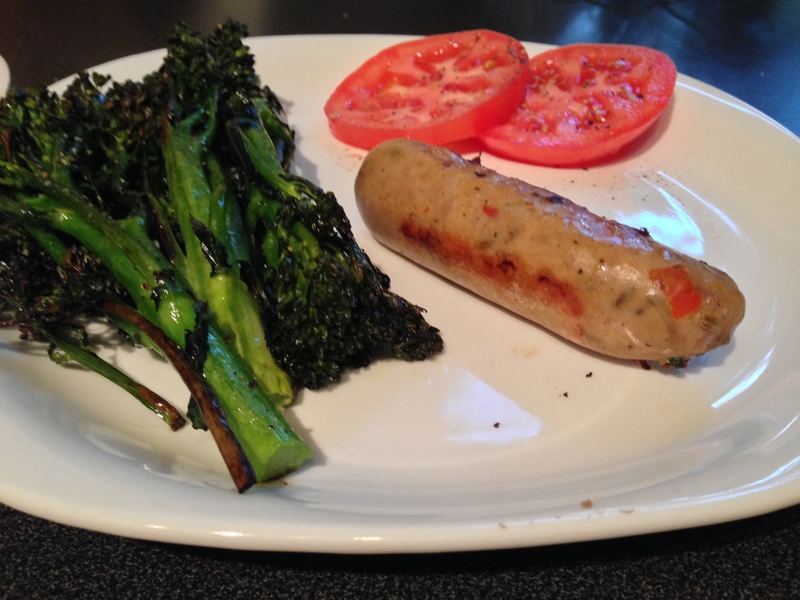 This is one of the only recipes I actually like that is based on a master recipe from the Whole30 program. I followed their directions once and tweaked it the second time and I preferred that version, which is here. To be fair, I haven’t tried all of their recipes (after 2 bad ones I completely gave up and have made up all of my own since) but of the ones I have tried, this one and a slightly modified version of their chili which I will post soon, are the only 2 I’ll make again. Heat olive oil in a skillet over medium heat. Sprinkle sliced chicken with salt and pepper then brown in a single layer for about 3 minutes per side until golden brown, remove from pan. Add 2 cloves chopped garlic to the pan as well as the sliced mushrooms and green onions. 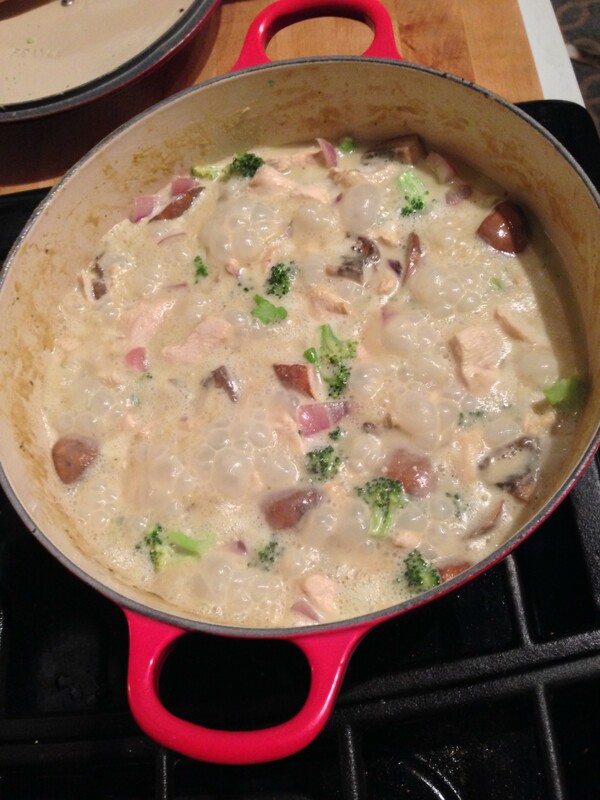 After about 15 seconds, add 1 cup of chicken broth and 1/2 cup of coconut milk and deglaze the pan (scrape the brown bits off of the bottom). Allow mushrooms to cook for a few minutes until soft and then add tarragon and chicken back to the sauce and bring to a boil. Lower heat and simmer for 5-10 minutes until sauce has reached thickness you want, I like it to just coat the spoon when I pull it out of the sauce. 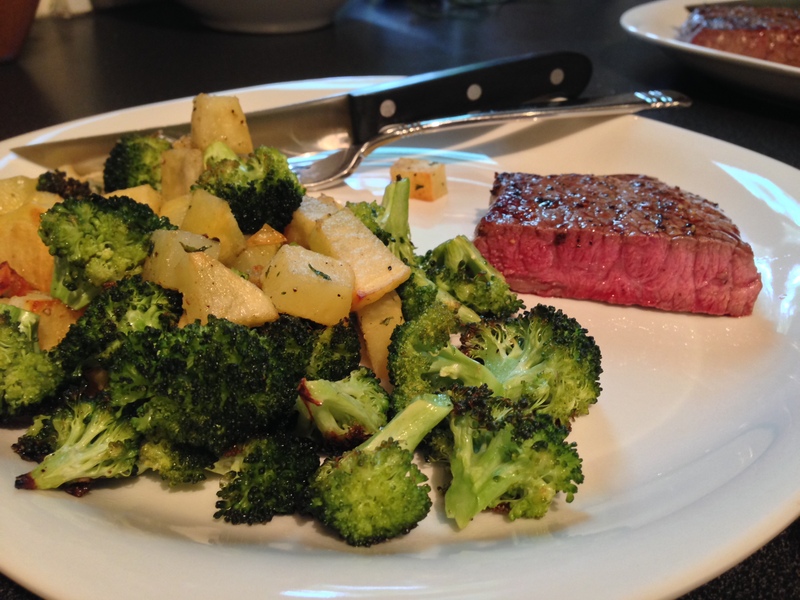 This dish is great with roasted veggies or potatoes as a side. It’s also really good heated up for lunch the next day which makes lunch at work a little more enjoyable than just a salad. Enjoy! Week 2 was a crazy week at work for me, so you’ll see a lot of the same things over and over. Not very creative, and Gil has now vetoed roasted broccoli for at least a week, but this is real life. We’re crazy busy but still making it work with the Whole 30. Side note: Week 3 is already shaping up much better, my menu plan is a lot more creative and it was actually even cheaper than last week despite me buying everything at Whole Foods because I didn’t have time for 2 separate grocery trips. To give you an idea of approximately what this meal plan costs, for all meals for Week 2 combined I spent $66 on organic produce, spices, coconut milk, etc. at Sprouts Farmers Market (I choose which veggies and fruits we will eat for the week based on what is on sale in the circular since, for the most part, all of my fruits and veggies are interchangeable in my recipes) and $78 at Whole Foods on grass-fed, organic meat and wild-caught fish. I bought some higher end proteins like swordfish steaks so it is possible to spend even less if you choose less expensive fish and cuts of meat. So I spent a total of $144 on groceries for 21 meals for 2 people which comes to $3.43 per person per meal. So not only is this meal plan really healthy but, even with high-end organic meats from Whole Foods, it is literally cheaper than eating at McDonalds. I still need to write up some of these recipes, I’ll get them posted as soon as I can.